Every time I move to a new home and have to set up a new studio, it takes some time to figure out, to find a rhythm and a system. Finally, after a few days of knee-deep hard work, a lot of help from my partner and months of tweaking, my studio feels clean, functional, and inspiring. 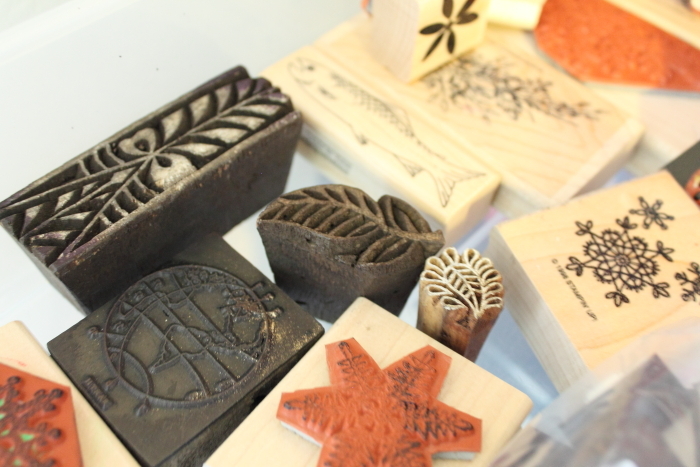 I walk by and can't wait to get in there and start making something. I think that creating a functional, enjoyable space is like finding mountain pose. It gives us a starting point, a way to feel the ground beneath our feet, a place to claim as our own and a place to fly from. 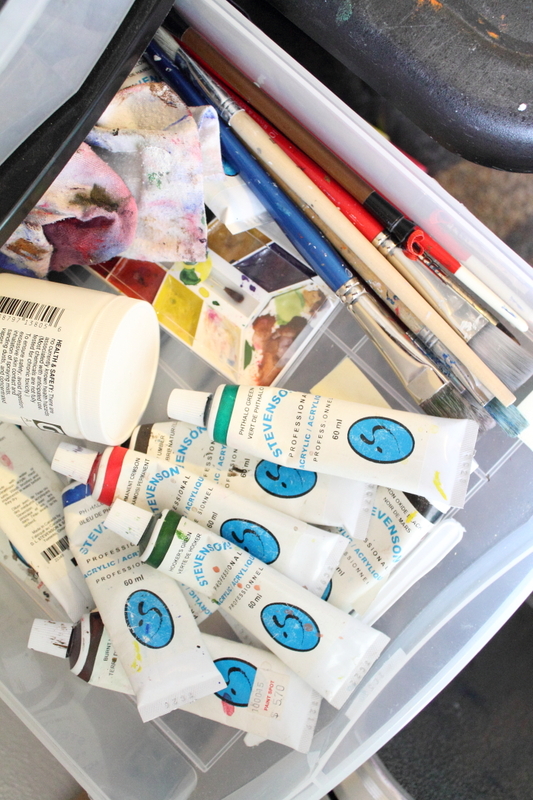 Setting up a studio is a deeply personal act and each choice made—even about seemingly mundane things like which drawer the paints should go in—connects us more solidly with our tools and materials and with the potential that they hold to take flight. 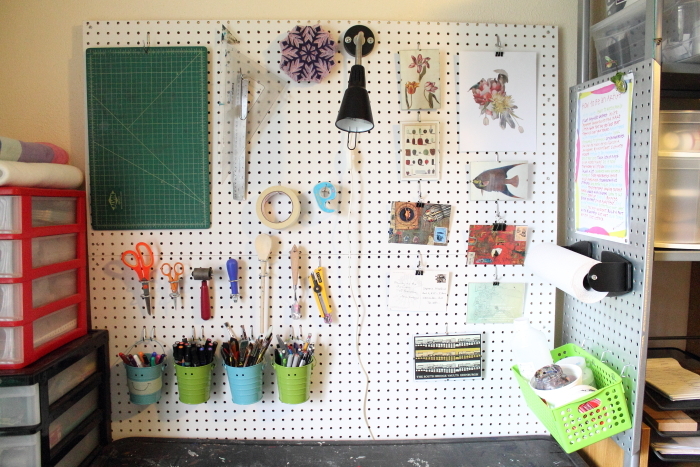 Set up pegboards for frequently used tools and decorations. My partner Matt was a huge help with this since he went out and got both the pegboards and installed them. At first, I wasn't completely sold on the idea but when I started looking around on Pinterest I got excited. Having supplies in front of me makes them easier to find and more fun to use. I'm not totally satisfied with the layout of the decorations—looking at these pictures I've decided to move things around so that they're interspersed with the supplies, rather than in their own section. Thankfully it's really easy to move things around! A messy table and a clean desk. I have two different work surfaces for different kinds of work. The plastic table is where I do my printmaking, collaging, and papier mache-ing, while the desk is for drawing, planning, or computer work. It's so nice to be able to leave one project in progress on one table and still have the other one clear. A spot for works in progress. If I need to switch between projects, I now have one of those desk organizers where I can put a piece of lino that I'm carving or notes and sketches for a project. My work (hopefully!) won't just gather in piles anymore. Separated workshop and personal supplies. I went out and bought separate supplies for my workshops so that I no longer have to dig through my own stuff and pack it up to take with me. Now I just grab the designated workshop bins and can take more or less stuff depending on what and where I'm teaching. The simplicity of it makes me so happy. I also have my collage materials divided up so that the stuff I love the most is in drawers and stays at home, while everything else is stored in clear bins according to its category, making it really easy to grab what I need. Found a spot for past work. I was using a bin filled with file folders for collage materials but realized that I NEVER went through it, and most of them were just taking up space. 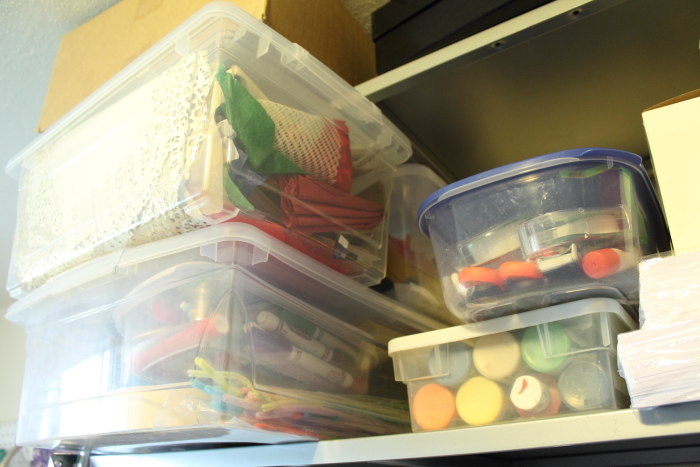 I went through it, got rid of a lot of it and put the rest in my workshop bins (part of the reason I teach workshops is so that other people will help me use up all the stuff I've accumulated). Now I'm using the files for past artwork, which never really had a home before. I have it sorted by drawings, collages, prints and other, making it relatively easy to find past work, either to show off or to repurpose. Put up decorations. I dug through my piles of art postcards for the most inspiring ones and pulled out a Papirmass print that's been waiting for a home. I used binder clips to hang them on the pegboard. They don't hang totally straight but, as Matt pointed out, they angle towards me when I'm sitting at the table to I can see them better. 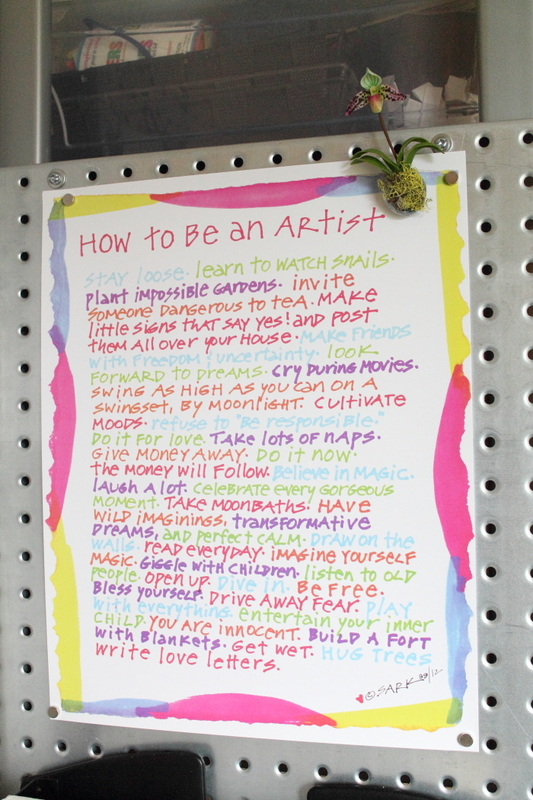 I bought a smaller version of the same "How to be an Artist" poster by SARK that I had hanging in my bedroom as a teenager because it always seemed like a solid manifesto for the life I want to lead. I put up cork board above my desk and am planning on filling it with photos and cards from people I love. It took a lot of time and energy and I often felt stressed that I was organizing instead of making stuff, but now that it's finished it has been so worth it. It has become a place where I feel comfortable disappearing for hours or days at a time and where I feel set up to let ideas flow. Do you have a sacred space where you can forget about everyday life for a little while? What did you do to make it special?